More than just an online travel guide, About-France.com is a website filled with hundreds of pages of relevant and useful information about France. The practical travel and tourist information pages on Paris, French regions, driving in France, and a whole lot more, are just part of a much wider exploration of modern France. Other pages of this website cover a wide range of topics of interest to students and anyone wanting to understand French life, culture and traditions, but also the nation's institutions and the French language. me of the greatest beaches in Europe, as well as the highest mountains and the finest historic monuments, the most beautiful cities, the most idyllic countryside, the most magnificent castles, the finestrivers, and plenty more, not to mention some of the best restaurants and the finest wines and more hotels than any other country in Europe. France has something for everyone, which is one of the reasons why it remains the world's number one tourist destination. It has magnificent holiday opportunities for everything from a short weekend city break, in places such as Paris, Nice or Bordeaux, to a relaxed family holiday in a gite in the countryside, a week or two's relaxation by the seaside, or an energetic break hiking, climbing, kayaking or cycling in France's great outdoors. Paris is just the icing on the cake - the French capital city and surely the most interesting city in the world. With its museums and monuments, its fine boulevards and its river Seine, its culture, its restaurants and its unique atmosphere, Paris is a city that you can visit for a week or a month or a year, and never tire of. In the memorable words of Thomas Jefferson, "A walk about Paris will provide lessons in history, beauty, and in the point of life." And much more too. But Paris is just a starting point. France is much so much more than just Paris. French museums and art galleries - which contrary to popular belief are not all located in Paris - offer a magnificent collection of works of art and artefacts; and for those for whom a holiday is an opportunity to discover Europe's historic heritage, France's great cathedrals, medieval castles, and thousands of other ancient monuments are a treasure trove waiting to be discovered. For themed breaks, the châteaux of the Loire (in the Centre region of France) are an obvious choice; among the many other historic sites, consider discovering the Roman remains of Provence , the medieval bastide towns of the southwest, or the castles and caves of the Dordogne. There are even some scenic steam railways for people who enjoy a trip down memory lane. Check out the regional guides for information on sights, monuments and tourist attractions in each area. In July and August, France's Mediterranean beaches tend to be pretty packed; this is particularly the case in the famous resorts of Provence and the French Riviera. By contrast, the long sandy beaches of the Languedoc offer much more legroom. Away from the resorts, Brittany offers plenty of good beaches, with the added fun of tides and good waves; and France's Atlantic coast, south of the Loire, has plenty of long sandy beaches, in the regions of Poitou-Charentes and Aquitaine. South of Bordeaux, there are mile upon mile of fine beaches. 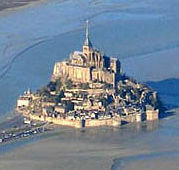 For more information see guide to the French coast. If you want the life, culture and bustle of the big city, go to Paris. But France is a lot more than Paris. There are plenty of places in deepest rural France that are still very much off the beaten track; and for camping holidays, gite holidays, or for those who are content to put up in small rural inns, several regions in France offer wonderful holiday opportunities away from it all. Five French departments (counties) that are particularly worth checking out are the Aveyron (Midi Pyrenees region), the Haute Loire (part of the Auvergne region, recommended for 2016 by Lonely Planet as one of the ten regions of the world to visit), the Corrèze (Limousin), the Jura (Franche Comté) and the Vosges (Lorraine): all these departments include sparsely populated areas, attractive scenery, and plenty of leisure opportunities - or just some great places to sit back with a glass of wine, relax, and enjoy the peace and quiet. One of the best times of year to visit France off the beaten track is Autumn, specially in the south of the country. 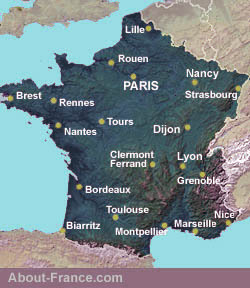 France has an extensive network of motorways, and many of them offer relatively relaxed driving conditions, except at peak periods. Off the motorways, driving on France's backroads can be a way to discover motoring as it used to be, a pleasurable experience and a way to discover the country. For more information click for our guide - driving tips and advice. and our checklist of things not to forget before you leave. Finally, for those who are looking for deeper information about France, this website contains pages explaining the main French institutions and the functioning of French life, including the education system and French universities , plus pages on the French way of politics, the French economy and the press. There is also a clearly written guide to the main points of French grammar. Use the site search function to look for information by keyword, or follow the hyperlinks from page to related page, to discover a wealth of information about France, French life and customs, tourism in France and the ways and life of the most visited country in Europe. With input from specialists in French and UK universities, About-France.com is a website that applies academic standards in terms of content, accuracy and style. Is France safe to visit ? The Tour de France 2019. Best heritage cities - A choice of the most interesting cities to visit in Fance - large and small. Other means of transport and travel in France - train, plane, canal and even on foot. Routes and maps for driving south avoiding the heavy traffic round Paris.